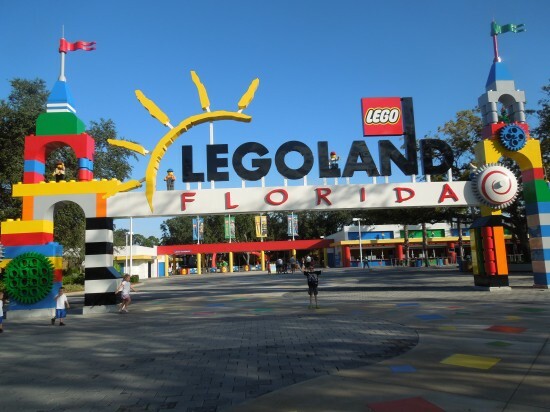 Legoland FL Front Gate – photo copyright Stephany Wiestling. All rights reserved. For my son’s 8th birthday, we took a trip to Orlando for the sole purpose of going to LEGOLAND® Florida… his Mecca. You see, at first glance, the tickets are fairly expensive. They’re not much less than Disney or Universal Studios. It’s actually fairly comparable to SeaWorld in size and price. Both can be done in a day or a day and a half. Both have shorter park hours, although LEGOLAND® is 2 hrs shorter closing at 5pm on weekdays and opening at 10am (SeaWorld is 9-6). But the big difference is that at the other parks, there are only a couple of rides my son can go on, whereas at LEGOLAND®, there’s nothing he can’t do. So that in itself makes it totally worth it. 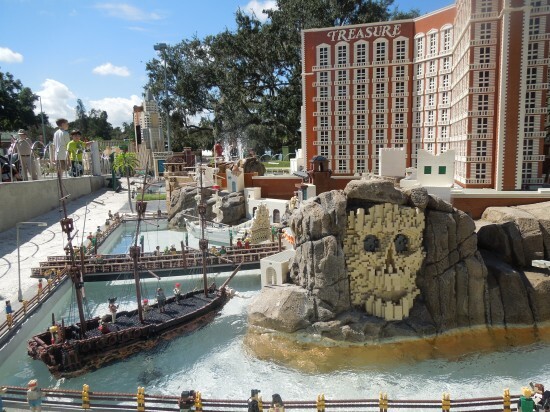 Plus, since he is absolutely OBSESSED with LEGO® anything, a whole theme park devoted to his favorite thing is the best thing he could ever imagine. So again, totally worth it. My 8-yr-old had the time of his life here. He was thrilled that he could do everything at the park… he was big enough to do everything, and nothing was too scary for him. It was right before Halloween, so we were there during Brick-or-Treat. It was so cute to see all the staff and park-goers in their Halloween costumes! The firefighter show was very funny and even in the splash zone you didn’t get very wet. Legoland FL Miniland – photo copyright Stephany Wiestling. All rights reserved. Miniland is amazing! However, do try to get out of the sun from noon to one. If it’s a weekday, head to the imagination station. The weather was perfect, so we were able to do one day at the theme park and the second day at the waterpark, which turned out to be the perfect way to go. Legoland FL Water Park – photo copyright Stephany Wiestling. All rights reserved. In the waterpark, we rented a cabana, and I always think it’s worth it to rent a cabana. We chose the least expensive one (by the wave pool), which turned out to be ideal and right where we were playing in the water anyway. Each cabana comes with a host (server), two complimentary souvenir beach towels, tons of bottled water, and a basket of Duplo® blocks to play with while you’re there. I thought my 8yo would snub the Duplos, but he gladly took breaks from the hot Florida sun (yes, even in October) to build with them. Cabanas can be rented at guest services. Prices are $80, $100, and $120 depending on location. 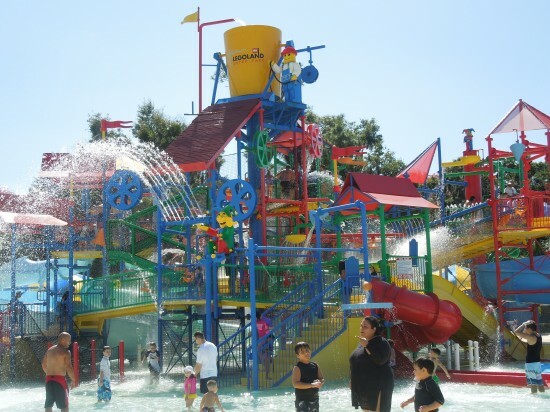 Otherwise, lockers are right inside the waterpark entrance, with changing rooms next to them, and throughout the waterpark there are chairs under umbrellas that are first come, first serve, and free. One thing worth noting: even though it was hot out, the water was FREEZING. The wave pool was the shallowest and therefore the warmest. It was also super fun, which kept our minds off the chill. But I would send out a plea to the theme park decision-makers – please heat the water, even in Florida. Speaking of being nit-picky, if said theme park decision-makers are reading this, I have another request: When the theme park opens at 10am, please have all the food stands open at that time. We didn’t eat breakfast and could not get any food whatsoever until 11am. What a missed opportunity in my opinion. 10am is perfect for late breakfast or early lunch. There is a waffle place and a place that serves fresh fruit cups in the park. Either of those would have been great for breakfast. Everything should be open and ready to take our money when the gates open. Admittedly, none of the friends I had polled before our trip mentioned any of these annoyances, so it’s possible that we just witnessed an off day. Just in case, eat breakfast before you go. On the upside of getting there early, if you are one of the first 200 cars in the parking lot (which opens at 9am), you get upgraded to premium parking for no extra charge. A nice bonus. Also, if you are there for the park opening, one of the LEGOLAND® mascots (Max and Buddy) chooses a child from the line to flip the switch that opens the gates! The kids were jumping and throwing their hands as high as they could to be chosen. They loved it! I recently learned that they just opened a Star Wars® section to Miniland, so now we have to go back! Have you been here? I would love to hear about your experience in the comments below! « Photo Friday: Caramel Apples – Disney Style!